Here you will find raku pottery making related information and supplies. We offer tongs, raku clay, raku glazes. We also have and books, videos and dvds on raku firing. 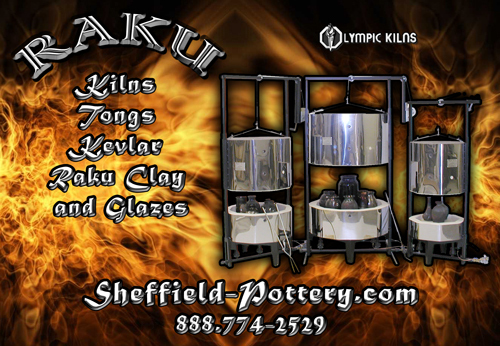 We also stock an inventory of specialized raku kilns for sale. Raku is an ancient Japanese technique that has been rediscovered by modern potters who appreciate its unique beauty and metallic luster and colors. The raku process involves reducing (starving the oxygen) the glazed raku pottery in combustible materials such as leaves, sawdust, newspaper, etc. When the pieces are ready to take out of the raku kiln, they are placed in galvanized trash containers with combustible materials and covered. Once the pieces are cooled down, they are removed from the containers, washed and reveal the rich warm effects of raku. RAKU FIRING - Raku glazes can be fired anywhere from 1600 F up to cone 06 (1850 F) in either an electric or gas kiln. We recommend firing 850 to 859 to a peak of 1700 - 1750 F and 860 to 867 to a peak of 1600 - 1650 F. They should be allowed to cool in the kiln to 1600 F. Different combinations of peak temp and reduction starting temp will produce different results. While still red hot they should be transferred as quickly as possible into a reduction bin (typically a lidded metal garbage can or small metal container that has been lined with organic material, such as newspaper and/or sawdust, etc.). As soon as the pieces are in the bin the lid should be put on to keep oxygen from entering the container, in order to develop the reduction atmosphere. The pieces should be allowed to cool in the bin for at least 20 minutes. When the red hot pieces go into the bin the organic material ignites producing flames and smoke so this part of the firing, particularly the opening of the reduction bin, should be done outside. * Establish a good seal to the reduction bin so that air is not entering and smoke is not leaving the bin. *Position the organic material ( newspaper, sawdust, etc.) and the piece so that the flames can get all around the piece. *Different organic materials may produce very different results, for example a glaze reduced in newspaper could be a beautiful blue color and the same glaze reduced in sawdust could have a metallic copper appearance. *Pieces should be cleaned immediately with water and a hard bristle brush. *After cleaning, warm the pieces in the raku kiln to evaporate any water from the piece. This helps to set the colors more permanently.